I got to new pet. Jenna bought me a pastel ball python from Nussman Reptiles. I am calling him Mosiro, after a clan of Akie hunter-gathers in Kenya. He’s eating frozen, and I think he’s gorgeous. I’ve always wanted my own python, though I’m glad it’s of this smaller, more docile species. 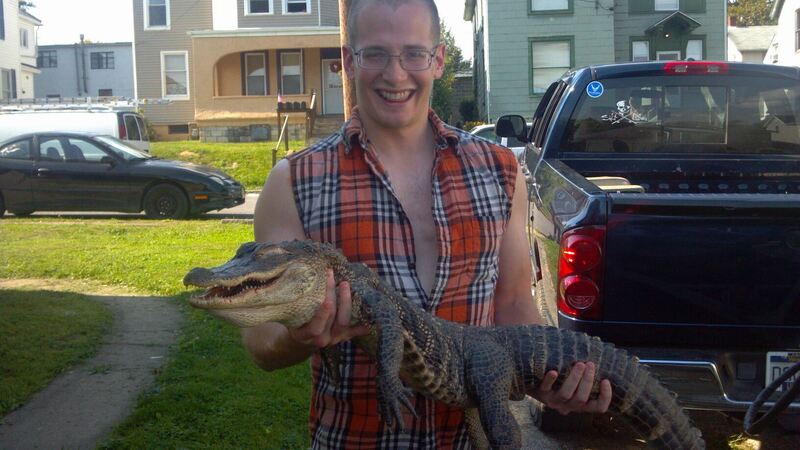 The West Virginia Division of Natural Resources received information that a reptile, possibly a caiman, was in the Mon River between Fairmont and Rivesville. DNR officials said people were contacting them about an alligator, although based on descriptions the DNR has received, it was believed to be a caiman, which is a member of the alligator family. DNR Wildlife Resources learned Friday afternoon that the caiman had been captured and killed by two fisherman Friday morning. Marion County Natural Resources Police Officer Jeremiah Clark said the fisherman planned to eat the reptile’s tail. It seems we have an epidemic of crocodilians being released in this state. Just a few weeks ago, an alligator was killed in Southern West Virginia. I know of a pet store in Marion County that used to sell alligators and caimans, which are not regulated in West Virginia at all. I was shocked to see them available for purchase. I’m amazed the rivers here in summer aren’t full of these inappropriate pets. Of course, this caiman would have frozen to death in just a few weeks, so it’s almost a good thing that its tail is now on the menu. Update: I’ve been informed that this animal is most likely an American alligator, not a caiman. It looks more like an alligator to me, too. However, I was trusting the WVDNR’s judgment here. Ab4458 the Edwardian lynx. Photo (c) Bristol Museum & Art Gallery. From Tetrapod Zoology. An errant Canada lynx was killed in the English county of Devon in 1903. For over 100 years, a potentially significant dead cat has been sat in storage in a British museum. 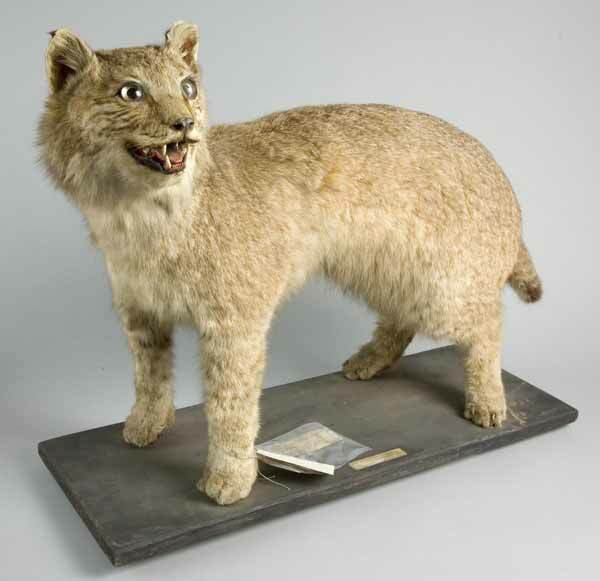 Specifically, the specimen – the lynx Ab4458 – has been at Bristol Museum and Art Gallery ever since it was added to the collections there in February 1903, and what makes it significant is that it was shot dead after living wild in Devon, southern England. As revealed in a new paper published by Aberystwyth University’s Max Blake and a team of colleagues (myself, Greger Larson, Charlotte King, Geoff Nowell, Manabu Sakamoto and Ross Barnett), the specimen represents a historic ‘British big cat’, though with ‘big cat’ being used very much in the vernacular sense, not the technical one (Blake et al. 2013). A lynx of any species would not technically be a big cat. The term “big cat” in the taxonomic sense applies only to the cats in the genus Panthera (the tiger, the lion, the jaguar, the leopard, and now, the snow leopard) and the two species of clouded leopard. All other cats are technically “small cats,” which means that the cougar, the largest of the small cats, is actually larger than the smallest of the big cats, the mainland clouded leopard. This particular lynx caused quite a stir before it was it was killed. Accession documents at the museum describe how it was shot dead by a ‘Mr Heb’ (the handwriting in the accession catalogue is difficult to read and this name might be wrong) after killing two dogs. It was then donated to the museum by a Mr J. Niblet of Newton Abbot, Devon. The geographical origin of the specimen is given as ‘Newton Abbot’. Foreign specimens are clearly marked with a place of origin, so we have to conclude that the cat really did come from Devon. No one really paid much attention to this cat until 2011, when Max Blake, a student at the University of Bristol, found it while doing volunteer curatorial work at the museum. The animal was quite clearly not a Eurasian lynx, as everyone had initially assumed. Blake, who was then studying zoology, knew it either had to belong to one of the two New World species of lynx, the bobcat or the Canada lynx. But the animal appeared to have a mixture of both Canada lynx and bobcat features. The cat had just enough facial markings to suggest that it was a bobcat, and thus, it could have belonged to one of the northern subspecies of bobcat. When I initially heard of this case back in 2011, I thought it was a northern bobcat, not just for those reasons, but because it is virtually unheard of for a Canada lynx to attack dogs. Bobcats, however, are much more aggressive animals, and in the wild, the larger subspecies are known for hunting mule and white-tailed deer. Canada lynx are rangier than bobcats, but they are actually lighter in weight than the largest subspecies of bobcat. And their diet consists of almost nothing but snowshoe hare. (Canada lynx are about the most bizarre cat species I can think of). The researchers were unable to extract any DNA from the specimen, but the museum did still have its bones on file. After a careful morphological analysis of its skull, it was determined that the cat was indeed a Canada lynx. This lynx had very worn out teeth, which suggests that is was of advanced age when it was killed. It also might explain why it was so willing to attack the dogs. It was desperate for some sort of sustenance, and dogs may have been the only suitable prey available. Examined with all of this in mind, Ab4458 lost its incisors during its lifetime. New bone then overgrew the alveoli*. Thick build-ups of calculus are present on its lower and upper premolars. Based on this data, we conclude that Ab4458 suffered from periodontal disease and – based on all that calculus – lived a life of 10 or 11 (or so) years in captivity during which it fed on soft, non-abrasive foods. In conclusion, we couldn’t find any evidence here that the animal lived for a long time in the wild. Rather, it had been a captive animal for years (Blake et al. 2013). So someone in Devon had been keeping a pet lynx for quite some time. It then was either released or got loose when it was about 10 or 11 years old. My guess is this cat came from Newfoundland. Devon and Dorset were the English home counties for a large number of fishermen who fished off Newfoundland’s Grand Banks. Newfoundland English is heavily influenced by the dialects from that part of England, where the people sound like stereotypical pirates. Perhaps a Devon fishermen brought home a lynx kitten for his children as a souvenir from his travels. The cat was probably a beloved pet for a few months. Then maybe it got a bit aggressive, and its owners moved it to the backyard, where it remained for the rest of its life. Until it escaped or was set free. Why are we trying to domesticate fennec foxes? The first is that fennec foxes don’t have the same musk glands as other vulpine foxes. That’s actually quite a plus. Other foxes– especially red foxes– are known for producing an odor that smells something like that of a skunk. Fennecs don’t produce that odor. The other is that fennecs live in packs. They don’t live in packs to hunt larger prey, but their family groups have essentially the same dynamics as a wolf pack. A wolf pack is based upon a mated pair that have an intense pair bond, and virtually all the other animals in the pack are their grown offspring, which stay behind to take care of their younger brothers and sisters. This same dynamic exists with fennec foxes. With more than two adults to forage over the desert, the young fennec kits get more attention and more food than they would get if only their mother and father were caring for them. Humans have already domesticated one dog species that has this particularly social arrangement. It’s actually been suggested that reason why humans domesticated wolves so easily is that both humans and wolves have similar social arrangements. Both wolves and humans may have recognized as similarity in this regard, and the two species were able to form very close relationships. Maybe something similar could happen with fennecs. 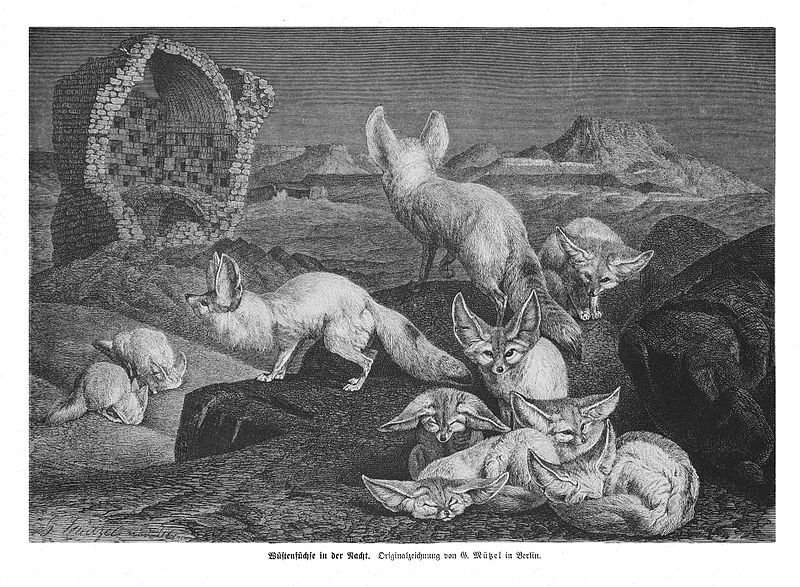 It’s certainly true that most fennecs in captivity today are derived from ancestors that were dug out of dens. In North Africa, people have kept pet fennecs for centuries, but it’s been only in the past few decades that anyone thought of keeping them in the West. They are still wild animals. Not all individuals have docile temperaments, even when bottle-raised. But it seems to me that as these animals become a bit more established in the pet trade, there will be attempts to breed them with more docile temperaments. Although we have domesticated populations of red and arctic fox, these animals are not widely available on the pet market (for the reasons I mentioned earlier). But fennecs could become the second canid species to become established as a domestic animals. All it will take is a large enough gene pool of captive individuals and a concerted effort to selectively breed them to be suitable pets. This may sound a bit far-fetched, but when I was a child, it was impossible to buy golden hamsters– even those with fancy colorations and coat lengths– that were naturally disposed to be tame. All of the hamsters I owned bit me at least once, and most bit at least once a month. Hamsters have been bred away from the grumpy little things that they are in the wild. And what’s more, pet golden hamsters derive from only a single litter that was captured near Aleppo, Syria, in 1930. They are perhaps the most inbred of all domestic animals, but even though they are inbred, they have been able to produce just enough genetic variation to produce unique coat lengths and colors and just enough variation in temperament to produce very gentle strains. Captive fennec foxes have a broader genetic base than golden hamsters, so it may be possible to begin another canid domestication process.